A nevus is a benign melanocytic neoplasm and is the most common type of skin tumour. It may occur anywhere on the skin, but its appearance in the external auditory canal is very rare. So far, fewer than 20 cases of nevus in EAC have been reported in the literature. ,,,, To our knowledge, no case of intradermal nevus is reported in any indexed journal with otorrhoea and otalgia up to this time. The common causes of mass in ear canal presenting with these symptoms such as aural polyps, foreign body granulomas, keratosis obturans with or without added infection and rarely a variety of benign and malignant tumours have a similar presentation. The purpose to report a case of intradermal nevus of external auditory canal with capillary proliferation and fibro hyaline area, discuss clinical and histopathological findings and conduct literature review. A 30-year old female presented with mass in right ear discharge from same ear for 15-20 years, decreased hearing for 1-2 years, mass in ear canal for 5-6 months, blockage of canal for 3 months, right earache for 1 month. Patient took conservative/interventional treatment at other centres for otitis externa, otitis media with polyp/granulations for almost 3 months [Figure 1]. Otoscopy showed papillomatous greyish pink mass adherent to skin of the whole of circumference of external auditory canal skin, which was tender and bleed on touch. The tympanic membrane was not visible due to the mass, clinically suggestive of Keratosis obturans with granulations all around. The patient underwent excisional biopsy via a post aural approach under general anaesthesia. 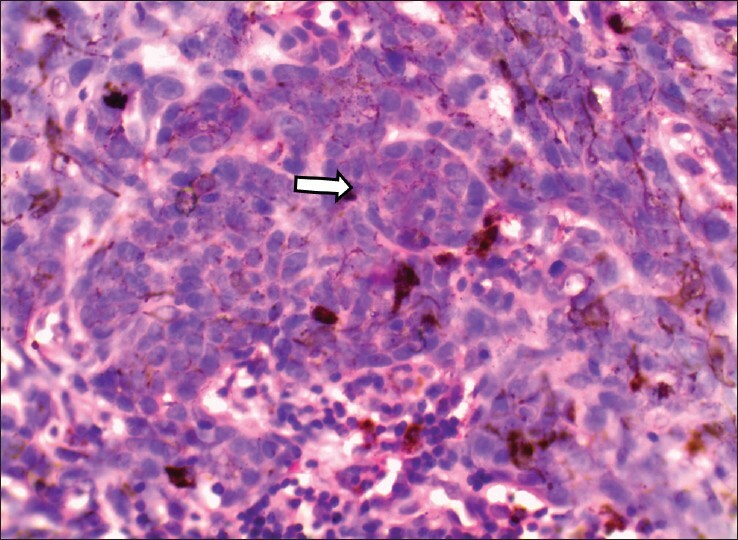 An elliptical incision was made around the mass with adequate margin under microscopy, and the mass was excised, which was subjected to histopathologic assessment [Figure 1] and [Figure 2], which revealed normal skin covering the specimen and numerous nests and group of melanocytic nevus cells located in the dermis with capillary proliferation and the fibrohyaline area, suggestive of Intradermal nevus. The underlying tympanic membrane was normal. Junctional: nests or group of nevus cells on the basal layer, form bulge on the dermoepidermal junction. Intradermal: cells are located on the dermis and are separated from the basal layer. Compound: show both junctional cells and other dispersed or grouped cells on the dermis. Flat: flat pigmented spots (Junctional nevus). Slightly elevated lesion: compound nevus. Halo: elevated lesions with pigmented macular ring around it (Compound nevus). Verrucous: pigmented lesions covered by fine excrescence (Junctional nevi). Dome like lesion: Smooth, forming globous-type elevation (Intradermal nevus). As to histopathology,  in childhood, 90% of the nevi show melanocytic proliferation on the dermoepidermal junction forming nests of nevus cells (junctional nevi). Upon interrupting junctional activity, it becomes intradermal. The occurrence in EAC was reported by Friedmann,  but most information came basically from the Japanese literature. The symptoms of presentation are mostly increasing deafness only. In our case the presentation was not with characteristic finding of an intradermal nevus but the histopathology examination confirmed as intradermal nevus. We believe that whenever a nevus looking ear canal mass is symptomatic, it must be removed with excisional biopsy by the transcanal approach but in our case as it was tried before we preferred the postaural approach to have a wider field and to facilitate complete excision. And the material should be subjected to pathological examination for confirmation along with other relevant investigations for further guidance on management. Intradermal melanocytic nevi of EAC are considerably rare and usually the risk of a single melanocytic nevus transforming into cutaneus melanoma is very low. They present usually with only symptom of decreased hearing. In this case the patient presented with complaints of ear discharge, otalgia, and deafness. These symptoms are present in common diseases like polyp with otitis media or keratosis obturans or rarely a malignant lesion. The purpose of this case report is to keep in mind such rare possibility with common symptoms of presentation. 1. Lee FP. Pigmented nevus of the external auditory canal. Otolaryngol Head Neck Surg 2006;135:124-8. 2. Kazikdas KC, Onal K, Kuehnel TS, Ozturk T. An interdermal nevus of the external auditory meatus. Eur Arch Otorhinolaryngol 2006;263:253-5. 3. Bothwell NE, Willard CC, Sorensen DM, Downey TJ. 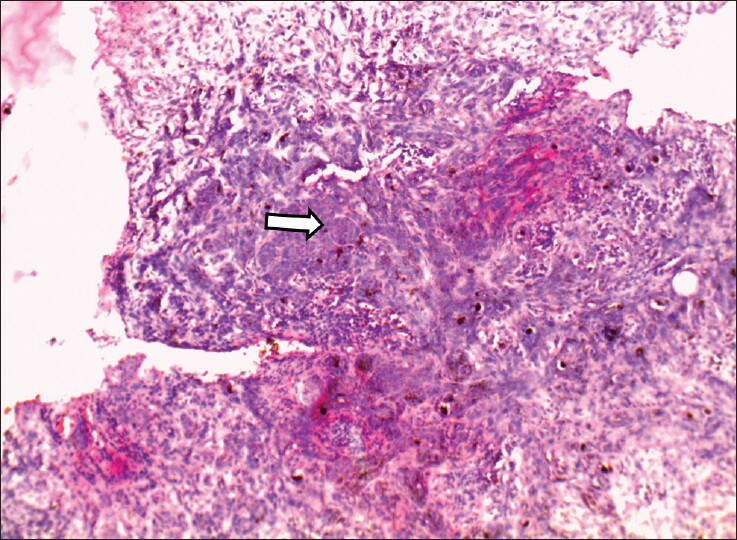 A rare case of sebaceous nevus in the external auditory canal. Ear Nose Throat J 2003;82:38-41. 4. Youngs R, Hawke M, Kwok P. Intradermal nevus of the ear canal. J Otolaryngol 1988;17:241-3. 6. Cuce LC, Festa Neto C. Manual de Dermatologia. Rio de Janeiro, Sao Paulo: Livraria Atheneu Editora 1990;428-31. 7. Glyne LR. Treatmentof pigmented nevi.4 volume, scientific reports Merck(Dermatology) publisher Scientific Publications Ltd 1961; 16-20. 8. Friedmann J. Pathology of the ear. 1 st ed. Oxford: Blackwell Scientific Publications; 1974. p. 156.